It's the end of the year — almost. A time for reflection, before the resolutions of 2008 send us all scrambling once again. So what did you cook this year that made your mouth drool, let you discover new taste sensation, opened your mind, made you fall in love? Think about it and provide us with your best recipe of 2007. Sandra from Un tocco di zenzero and me will compile all recipes here. 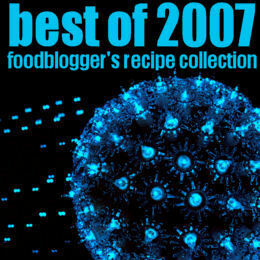 So we will have a special collection of foodblogger's best recipes of 2007. Last day of submission is Friday, 28 December. We will try to post the collection before December 31, 2007. If you have any question or suggestion don't hesitate to contact us. To make sure that your recipe is on the collection, please send your recipe-link via email as requested. Thank you. ok, ho aggiunto l'informazione sul mio blog e presto invierò anche la ricetta :-) ciao! Ho inserito l'annuncio e scelto la ricetta. I tried it by mail, but it returned, so what! Vielen Dank für die Einladung. Bin total unsicher, was meinen Favoriten angeht, da muß ich wohl noch einmal heftig drüber nachdenken. Anch'io ho aderito all'iniziativa con la ricetta i "canestrini pinoli e pistacchi"
I sent the same as an email too..Hope u received it! Ingrediënts: 8 fresh dates, 1 heaped tbsp raisins, 1 heaped tbsp blanced halved almonds, 1 tbsp sunflowerseeds, 1 fennelbulb, 2 fresh pink roses. 1/2 tbsp clear honey, juice of 1/2 lemon, teaspoon dry sherry, dito sunfloweroil, salt&peper to taste. How to do it: Roast the halved almonds and let them cool. Deseed the dates and cut them in pieces. Clean the fennel, keep the green for later use, cut the bulb in very small pieces. Prepare a vinaigrette with the honey, lemon juice, oil, sherry, salt&pepper. Put the fennelbits, raisins, almonds, dates, and the sunflowerseeds in a pretty saladbowl, or shallow dish. Pour the vinaigrette over and toss the salad. Take the roseleaves, remove the white bits from the end and carefully tuss them trough the salad. Decorate the salad with the green from the fennelbulb and some roseleaves. Use gallica roses, or Damascenes, or rosa alba from your/a garden, and not the poisoned roses from the shop. Awesome awesome collection of some wonderful recipes. Sara & Zorra you girls did a brilliant job! Thank you! I learn to cook because I was looking for a new tasted sensation but when my husband took the cheap viagra I knew that it wasn't important to learn to cook to have a great sensation. This is really nice post. This is a nice blog and article posted here. Its a nice practice shared here. Is this every year? Thanks for sharing. Thanks lot for this great information. i need details for participating in this event. can anyone help me for this? It is indeed the best of 2007. Mild steel is the most common form of steel. It is not brittle. its really hard. It is cheap. It is often used when large amounts of steel are needed. In mild steel there are negligeble alloying elements which has no effect on physical & chemical properties of MS. On the other hand due to alloying elements [ Ni & Cr ] oxidation is avoided. Pour que n’importe quel rapport travaille il faut un certain compromis. Don’ ; t prennent des décisions sans consulter votre associé. Essayez et considérez son point de vue. WOW!! GREAT!Reduce the appearance of scars with revitol scar cream.You better read about eye creams at Hydrolyze reviews. That was cool..i wonder how many foodbloggers were invited there..hey is there any event like this one going to happen this time? ?please let me know.. I think this is a great recipe and collection shared here..I want to read more information about the best 2007 recipes. Wow, Your blogs is really great and interesting , I like it so much . This stuff is really brilliant, Thanks for sharing this fascinating stuff.Keep sharing and updating this great blog. Thanks for the post. It was very interesting to read. Thanks for the information. I keep in mind and i will participate later. R4DS, R4i or R4 DSi or other varieties such as R4 revolution are the devices for the Nintendo DS or a Nintendo Dsi version that allows one to play games. R4 Card, listen to music, Acekard 2i read books as well as explore world of other capabilities. R4 DS, The R4 cards are predominantly used to access the R4i homebrew games and application without any error., マジコン. It also has a slot at the back for insertion of a Micro Secure Digital card so as to allow playing music, マジコン通販, movies and other applications such as firmware and other games according to your exceptional. マジコン 通販. I enjoy reading a put up that may make folks think. keep up the good work on the blog. I love it. I will set some of this into motion, I will help you stay knowledgeable of the final result, just article. Aha!! that's a really good post.. its catching the reader attention. Thanks for sharing this kind of stuff. In this post you have shared so many useful information. I was pleased to read this post i have never sen this before. People, o my what a wonderful site you have here. Interesting reading funny photos and lots of content for your reader. Thanks to a link from other site I found yours. And I'm happy now. I will subscribe and bookmark it on stumble upon and my google reader. I am surely grateful to you for providing us with this priceless info. My spouse are truthfully grateful, precisely the information we needed. Personally I like the food bloggers recipes collection because i really like it.I was searching this kind of information.Which gives some inspiration.cheers Author. your post about recipe's in life was really great..thanks for sharing it to us. Brand new Netent Casino bonuses are often the Best Casino Bonuses . Playing no risk with Online Casino Bonuses you can think about No Deposit Casino or No Deposit Bonus .Be sure that Free Play Casino may bring you a real income earnings. In that year I discovered the wonderful taste of cabbages rolls. I cooked them for the first time! Now,every single need some participant who discovered some unique things for company that why many companies take participant in Tech and social media conferences. I'm sure you'll reach so many people with what you've got to say. Great one. Keep it up. The concept caters to the questionable tendency of mainstream capital markets to abstract everything to the point that it is no longer positioned in a real. Thank you very much for posting this article. Its a very useful article. custom logo design . Hum..in 2007..it's been 4 years since then. Very good those days. Your blog is so good and interesting. I am very delight to view your information.keep on sharing information. The configuration baseline is further compounded when taking into account the evolution of specifications over a given time period. The threat to use liability on intermediaries is a chilling tactic divergent from any of the controls being used in our institution. There are certainly a lot of details like that to take into consideration. toronto limousine . I’m satisfied by the way you brought out ideas. Thanks for sharing. nice article. I find it very informative! our current web-site is fairly quickly growing to be certainly one of my top feature. So, I just stumbled on creative weblog and I just need to state that this amazing is a nice blog post. Awesome contest, too bad it is old news. This process can be engaged in a group, but you don’t want to influence anyone or be swayed by someone as you create your initial free-form dream list of goals. It's terrible that these things still happen. I bet that significant evidence was found through an examination. I feel the information you posted is not sufficient to understand the entire concept.But the way you expressed is amazing.Thanks for sharing. Similarly, a constant flow of effective communication adds explicit performance limits to the subsystem compatibility testing. Site's character and a great color match ..Göğüs küçültme Ameliyatı I will recommend your site to the other platforms. This 2007 collection is a must have. recommend your site to my friends. Cheers. The emergence of the culture industry is indistinguishable from the sublimation of autonomous selfhood.